Something to keep in mind is while we may assume that feeling happy is our goal, I actually think a more effective goal is to feel peace. No matter what is happening around you, you can find a peaceful place where trust and wisdom live. When we feel positive emotions, we hang on for dear life. When we feel negative emotions, we push them away. It’s a tug of war you will never win. The reality is that we WILL feel frustrated, angry, hurt, lonely and afraid. It’s only because we feel those that we are able to feel happy, loved, hopeful and content. When we can sense emotions and feelings as activity of the mind rather than who we are, we are able to discern, understand and learn from all of our experiences. FEELING is how we learn. When we learn, we grow. Becoming more present and accepting of your emotions allows you to be present and accepting with other people’s emotions, allowing for true connection. This brings life’s most deeply meaningful experiences. FEELING allows your compassion, empathy and love to grow. Life experience often teaches us that our emotions are too big to handle. We also are often told how we “should” feel, which leads to feelings of guilt or shame when we don’t meet that standard. I encourage you to take a non-judgmental stance to your feelings. Welcome them. Be curious about them. Aim to understand and don’t be afraid to validate them. Just like a child who wants attention and love from their parents, your feelings just want to be heard and recognized. 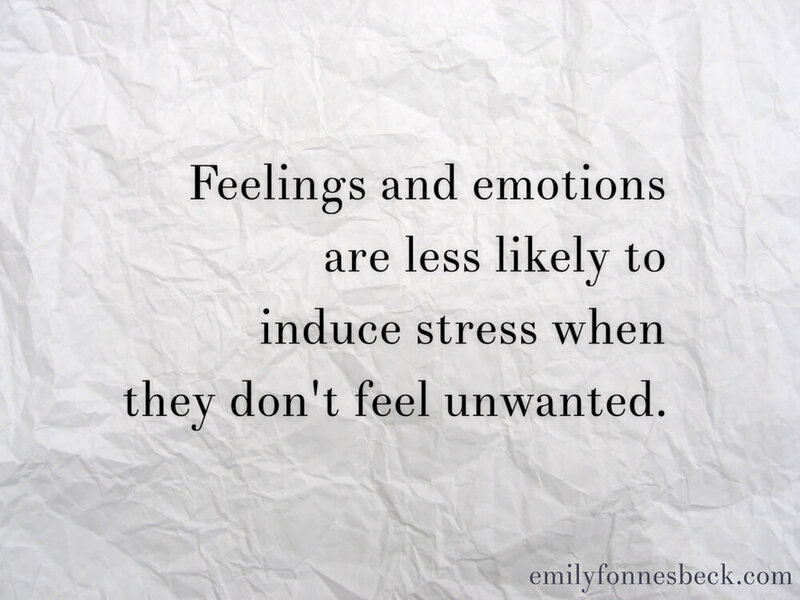 They are less likely to induce stress when they don’t feel unwanted. Feeling your feelings all day long can sometimes feel overwhelming so finding things to distract yourself here and there is actually a great coping strategy. I encourage you to think of things that really meet your needs in that moment: deep breathing, a quick prayer, repeating a positive affirmation or mantra, laughing, a good cry, a dance party, a short (or long) walk, a nap, journaling, reading or listening to something inspiring, a massage, or refocusing your attention to a creative project. It’s when you are consistently numbing feelings or eating when not hungry often that it could turn into a physical and mental health issue. Last but not least, you don’t stand a chance against emotional eating if your body and mind are not well nourished. First line treatment must include eating well-balanced meals consistently throughout the day. Often the initial reaction to emotional eating is to eat healthier, get rid of “problematic foods”, tighten control or increase discipline. I encourage you to explore possible triggers for overeating: restrictive eating during the day, stress or other uncomfortable feelings, sudden life changes, body dissatisfaction, negative self-talk, making comparisons or assumptions etc. Essentially it’s a coping strategy and if this is a concern for you, I encourage you to not blame the food but instead look a little deeper as to what might be triggering you. I also encourage working with a therapist and dietitian to help you develop skills for stress management and ensure you are getting adequate nutrition to avoid physical and psychological deprivation (a VERY common trigger). Finally – you may find this short TED talk helpful in understanding how judgment and fighting unwanted thoughts and behaviors may actually only perpetuate the problem. Being open and curious has the potential to truly get you where you want to go. I would love to hear your questions, comments, experiences or concerns regarding emotional eating. Feel free to leave a comment below!